As the only self-study CPE website you will ever need, CPEThink.com have expanded our educational tools and resources. Tired of your eyes crossing in the middle of a budget spreadsheet technique's course? We are too! Instead of having to read line after line, the information is presented in an easy-to-digest manner. We’ve created our video CPE courses in order to help you get the most out of your continuing education. CPE video learning offers incredible benefits for the agent who learns better by hearing, wants to study on the go, tired of reading, or just wants a personal approach to their education. Our CPE video courses can also be used to supplement your reading material to ensure your highest exam score possible. CPEThink continuing professional education video courses cover topics including ethics, accounting, taxation, and other audit requirements. Convenience and accessibility are important to us. Download your video CPE course onto your mobile device, Bluetooth it to your car radio, and you’ve just created learning on the go! Review marketing and networking material, understand value pricing and develop your niche all while driving between clients. To think they say accountants aren’t tech-savvy! Our flexible learning formats bring your required comprehensive learning tools to your phone, tablet, laptop, or T.V. Video CPE helps you maintain and stay up-to-date with your most important credit and licensing requirements. It also serves as a way to make sure you’re always on top of your education so that you are capable and ready to offer your services with a competitive edge. Being about to pause, rewind, and replay a course has proved invaluable to the thousands of licensed agents registered with our video CPE course. This flexible self-study format allows you to learn anytime, anywhere. Download your video and text to listen and engage with your course material. CPEThink speakers and instructors bring you years of industry expertise and have a background in finance, accounting, tax, and education. Our curriculum is formatted to help you stay ahead of new rules, regulations, and best practices. Combining decades of field expertise and modern technology, our qualified CPE video courses instructors walk you through the only online resource you’ll need in your CPA career without the boring graphs and cold classrooms. Explore the finance and accounting courses that you need to fulfill your requirements with the all-inclusive accounting video CPE courses for CPA’s we provide all the tools and resources you need to stay ahead. As your library for all things pertaining to online accounting credentials, our video CPE courses for CPAs bring you all the sources you need to enhance your skills, develop your competitive advantage and maintain your licensing requirements at a pace the suits you best. We provide you with the educational resources you need faster, easier, and more ahead of the curve than ever before. Receive your credentials from industry-leading instructors and curriculum with our on-demand self-paced accounting videos, today. 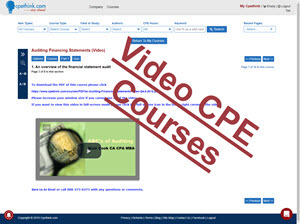 Video CPE Courses are what busy CPAs and IRS EAs look for to be efficient and effective in taking their required CPE. With no time to waste and little time to spare CPAs and EAs need concise and complete online CPE courses accessible anywhere they have a device that can connect to the Internet. Cpethink.com would love for you to check our reviews and see what other customer are saying at https://www.cpethink.com/cpe-reviews. Only customers that have made a valid purchase and completed a course may leave a review.